The first part download and compiles the PHP binary and puts it into /runtime/bin/php and also copies in the bootstrap files required to make the layer act as a Lambda runtime. The second part simply copies all the files in /runtime in the first container into a new container. This new container containers a single layer which is our PHP runtime. $ docker build -t lambda-php-runtime . The tag name can be anything. This tool will find the layer in the runtime container and upload it to eu-west2 and then store the identifier in output/layers.json which looks like this. This is the way that we can re-use our PHP runtime in all our actions across multiple projects. This has the advantage that when you re-build and upload PHP runtime layer, your project picks it up, which could also be convenient. One of the benefits of building the runtime in Docker is that we can run it locally for testing our Lambda function. 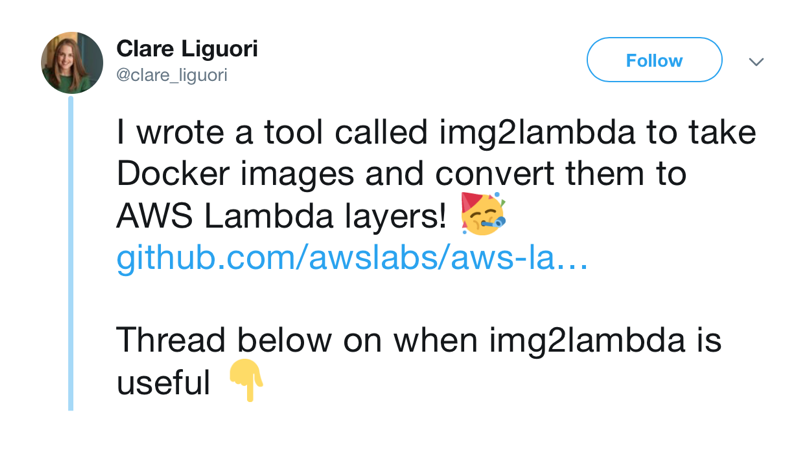 As our runtime container inherits from lambci/lambda:provided, we get an environment that looks very much like Lambda itself. $ docker build -t lambda-php-test . I really like the separation of publishing the PHP runtime layer from my project and the ability to reuse this layer in multiple projects is magic. Ideally, I would like to be able to update the layer with a new patch release of PHP and use the ARN so that all my functions don’t need to be re-deployed. Maybe I’ll look at how that can be done at some point. Have a play with my lambda-php project to see if this approach works for you. Also check out Bref for another way to run PHP on Lambda.